As inspiring as the excitement of the big city may be, it is all the more refreshing to leave behind the often hectic hustle and bustle for a while. The new “?” garden restaurant designed by 4a Architekten provides this opportunity right in the middle of the metropolis of Kiev. Its stylish and exclusive atmosphere invites visitors to relax and delight in this green oasis. Not only the garden restaurant’s location – a green space surrounded by historical buildings at the heart of Kiev – but also the old trees with their protective canopy of leaves have helped shape the spot and give it its unique atmosphere. The central concern of the Stuttgart architects was to capture these characteristic features and further enhance them with a sensitive approach to the overall design: floating levels, lightweight structures and clear, elegant materials characterise the ambience of the garden restaurant. The visitor is welcomed and guided through a distinctively designed timber entrance tunnel. The inner courtyard thus remains completely shielded from the outside world, giving the visitor the feeling of entering into another, separate world. In order to highlight the particular character of the site – a green oasis at the heart of the city – the garden restaurant has been purposely reduced and simply designed, both formally and with regard to the choice of materials. The terraced bankirai decking with generously proportioned lounge areas pick up on the natural character of the surroundings. The sense of floating gives the location the appearance of being largely untouched. This impression is emphasised atmospherically through the linear lighting of levels and structures – both the wooden decking and the lounge furniture on the platforms seem to be detached, as if floating above the green space. 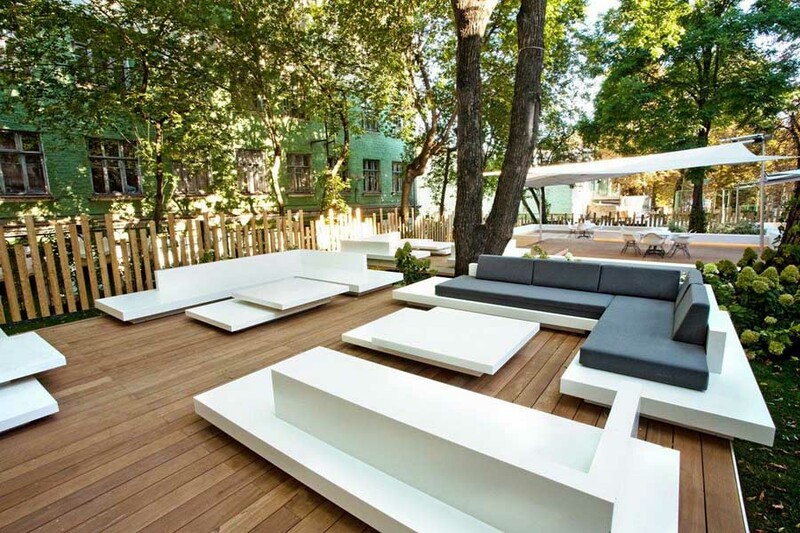 The seating furniture, made from white Corian, invites guests to relax and enjoy. Stretched over some of the platforms are triangular sails. These provide protection from the sun and rain and can be furled automatically as necessary. The lightweight and elegant construction acts as an architectural design element and gives the garden restaurant its Mediterranean character. A timber wall extends from the entrance, along the historical building, then right into the garden. It conceals the single-storey conservatory which connects onto the historical building to create a uniform al fresco appearance. The conservatory accommodates around 120 open-air restaurant seats along with additional covered seating. The conservatory too is characterised by a clear and subtle design: white, back-spotlit curtains form small niches with an intimate atmosphere. The folded ceiling underlines the particular character of the space. The kitchen and storage and function rooms are located in the cellar of the building extension. The garden restaurant was designed down to the smallest detail by 4a Architekten. A crucial role was played here not only by its relationship with the locality, the establishment of shape and form and the choice of materials, but also by the lighting concept designed by Ulrike Brandi Licht. Lighting elements comprising linearly arranged LEDs in the wooden decking and seating furniture subtly enhance form and material. The brightness and colour ambience of the LEDs can be individually controlled, allowing the terrace floor to be illuminated to create the required mood. Decorative lighting such as impressive chandeliers and mobile light cubes on the tables provide the finishing touch, forming the perfect setting for a relaxing break in the garden restaurant.